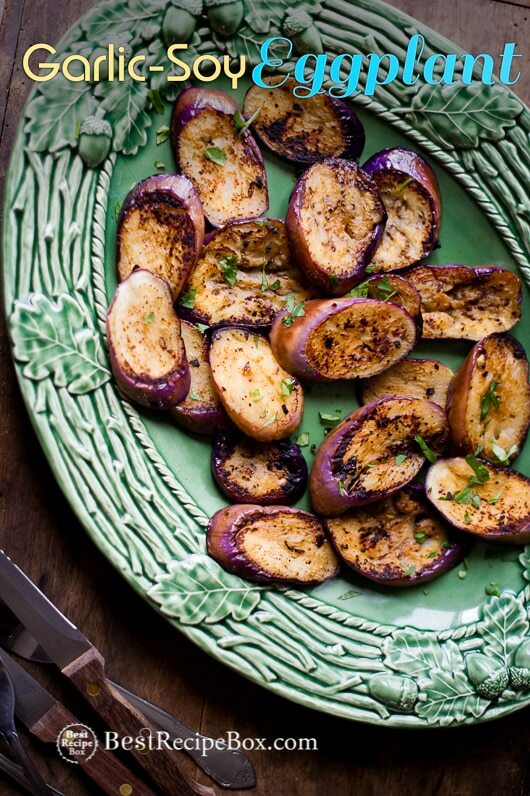 In Summer, we’re swimming in eggplant recipes. This is a special vegetable to us and it’s one of the under-appreciated vegetables because everyone thinks it has no flavor. Well they’re wrong! When eggplants are peaking, one of our favorite ways to eat eggplant is a quick grill on the pan with our favorite garlic-soy marinade. This Asian inspired grilled eggplant recipe is addicting, so you might want to double or even triple the batch if you’re planning on serving it at a dinner party. When seared and grilled on a cast iron skillet, the slices of eggplant becomes soft, tender and will melt in your mouth. The best part about this recipe is that the eggplant absorbs the wonderful flavor of the garlic-soy marinade and each bite is savory, tender and delicious. Serve this as a quick and easy vegetable side salad or add it with some brown rice for a simple and healthy eggplant dinner. This technique is super duper easy and it really brings a fantastic texture to the eggplant that doesn’t make it soggy or bland. That’s one of the problems with people thinking eggplant is soggy. When grilled like this, it’s tender and delicious. Give it a try and it just might be one of your favorite Summer vegetables to grill! It’s the perfect outdoor bbq dish that deserves to sit alongside all the grilled corn and sweet watermelon. 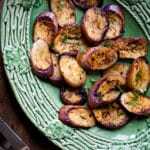 More eggplant recipes: eggplant vegetable stir-fry and roasted eggplant with mint recipe. This post was originally published in 2014 and re-published in 2017 with new video! Please read recipe post for more recipe details . 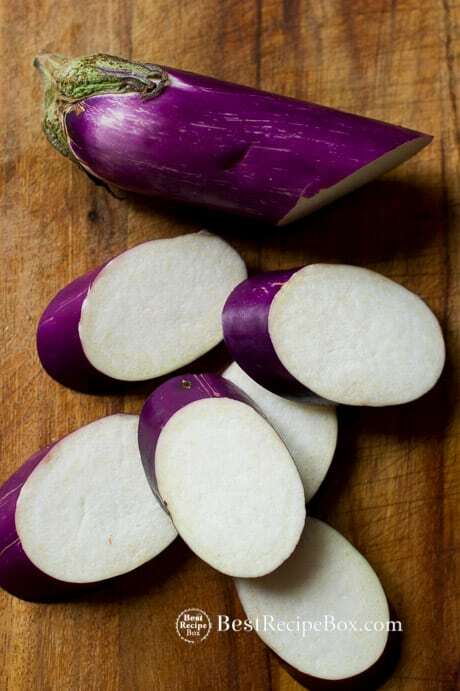 We love tender Asian or Japanese eggplants because they don't require pre-salting nor are they heavily seeded. These eggplants always cook up to a wonderful, tender texture. Make the marinade: in bowl combine olive oil, garlic, soy sauce, dijon mustard, lemon juice, salt and pepper. Mix ingredients together well. 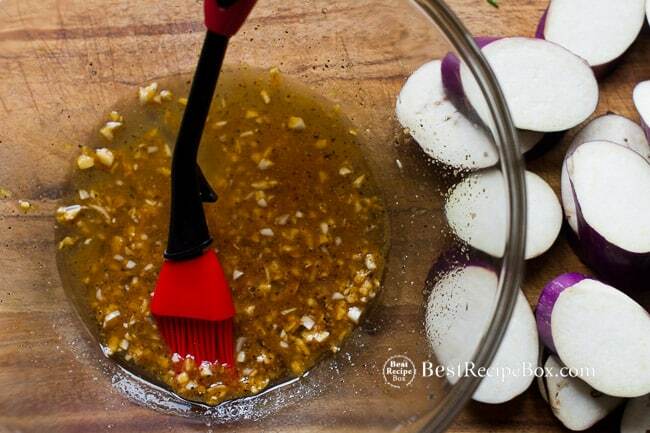 Brush the marinade on the eggplant slices to coat all sides. Do not immediatly add all the slices of eggplant to the marinade because the first few slices that touch the marinade will soak up all the marinade, leaving nothing for the rest of the eggplant slices. Heat large skillet or cast iron pan on medium-high heat. Once pan is heated, lay eggplant slices on the pan and grill them for about 2-3 minutes on each side, or until golden and tender. Repeat this process for all the eggplant. Garnish the eggplant with cilantro or parsley. Serve warm.